Treasure! features interactive, hands-on exhibits. Attendance at the Northwest Museum of Arts and Culture is booming. On a rainy weekday morning, busloads of excited schoolchildren pile into the atrium every quarter-hour. In the MAC Café, a group of Red Hat Society women decked out in purple and red are gathered for lunch after perusing the galleries. A couple of weekends ago, as the recently installed Treasure! exhibit debuted alongside the ongoing LEGO-themed Nature Connects sculpture showcase (its last day, however, is Sunday, Feb. 7), Saturday admissions alone numbered more than 1,300 visitors. MAC staff haven't seen it this busy since back in 2011, when the massive Leonardo da Vinci exhibit, touring internationally, filled the galleries for just three months. The museum's switch back to a schedule of quickly rotating exhibits — seven more are planned to debut before year's end — is already showing signs of success a month into 2016. Themed around the history of treasure hunting and the technology used by those who seek it, Treasure! focuses on several areas, including sunken or buried loot, natural treasures of the earth like gold and other minerals, and antique or otherwise aged relics intrinsically valued for sentimental or historical significance. Curated and leased out of Seattle by NRG! Exhibits, Treasure! opened less than two weeks ago; several local components created by MAC staff are gradually being added in the coming weeks. In a gallery above the museum's large lower-level exhibit hall, staff are setting up a space to house a new semipermanent feature called "The Secret Life of an Artifact" that will continue even after Treasure! wraps up. Visitors can observe how staff preserve and catalogue new additions to the museum's massive collections, which it oversees as the Eastern Washington State Historical Society, an official trustee of state history. Real work on the museum's collections is planned to take place here, just as it normally does in the cavernous basement where the MAC's historical treasures are preserved, says John Muredo-Burich, director of museum experience. This upcoming feature also serves as an acknowledgment of the detailed work completed over the past year by the MAC's small collections staff, who sorted and catalogued more than 59,000 items, he adds. Alongside this working lab, visitors can see some of the more unusual or eccentric pieces the museum owns that might not always tie in with in-house exhibits. A collection of children's shoes from across the decades, for example, are to be displayed there, along with other rotating samples of local treasures in its care, Moredo-Burich says. In the same gallery, he adds, visitors can also learn about museums' never-ending challenge to preserve all types of aging materials, which are in a constant state of chemical degradation due to contact with other materials and the environment around them. As visitors descend the staircase from the sunlit atrium to the basement galleries, a high-pitched beeping is audible over the rumble of cannon fire. Treasure! 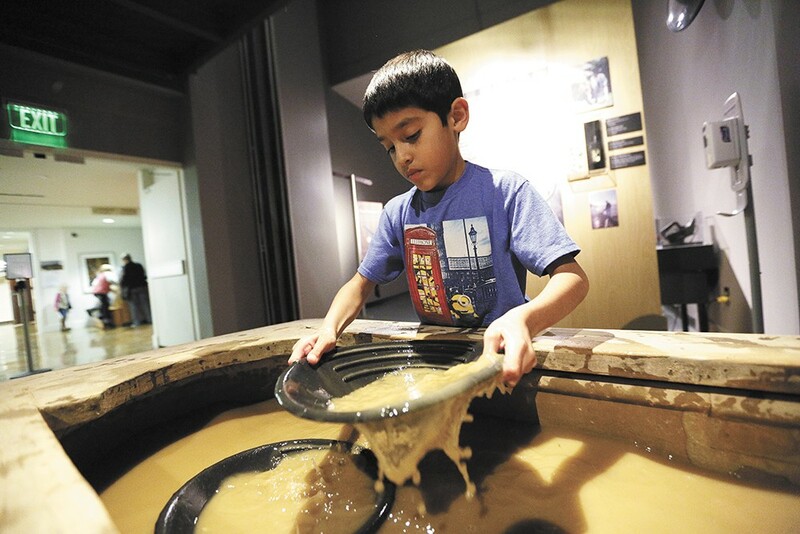 is a dominantly interactive exhibit, with kid-centric activities that include taking out a (digital) pirate ship with cannons, looting through a sandbox-like area with metal detectors, panning for "gold," and cracking the vault combination of a bank safe. Muredo-Burich sees Treasure! as a good fit for the MAC's all-ages audience because of its varied presentation of information. While there are plenty of hands-on activities to entertain young visitors, traditional display placards explain in detail the artifacts and themes of the exhibit. A highlight of these physical artifacts are pieces of stunning Spanish shipwreck treasures — an 80-pound, pure silver bar, precious metal coins and pure gold jewelry — found off the coast of Florida by salvage diving couple Bob and Margaret Weller. Many of their centuries-old findings are featured throughout. In an effort to connect the touring exhibit with the local community — as was done for Nature Connects, which invited locals to build and submit LEGO sculptures for display and a contest — Moredo-Burich also invited MAC staff and supporters to loan some of their own personal treasures for display. Gradually being placed in the galleries, these personal collections and sentimental pieces of ephemera include a vintage marble collection, a poster from the Lindbergh baby kidnapping, a French doll and WWII memorabilia.